For the first time in Kazakhstan, a monitoring group has been established to carry out permanent and independent public monitoring of penitentiary institutions for children. The group, which sits under the Commissioner for the Rights of the Child in the Republic of Kazakhstan, was created with the support of PRI and UNICEF. The monitoring group was officially launched last month, when the first training session took place for monitoring officials, who come from 50 non-governmental organisations from various regions of Kazakhstan. 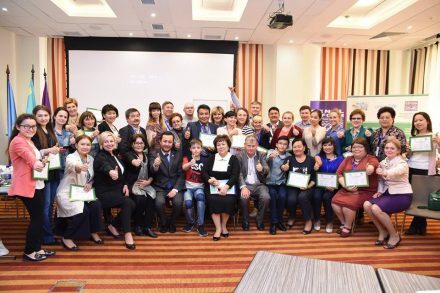 International and national experts from Kazakhstan and the UK, representatives of non-governmental organisations and public monitoring commissions took part in the training. Training will continue in July and August, and monitoring of closed facilities for children will start from September 2017. Participants at the training for monitoring officials. More photos of the launch event can be seen here. Read PRI’s Ten-Point Plan for Fair and Effective Criminal Justice for Children, which outlines ways that law and policy makers and criminal justice practitioners can respond effectively and positively to children in contact and in conflict with the law.